A Tranquil Sea in Real Estate. 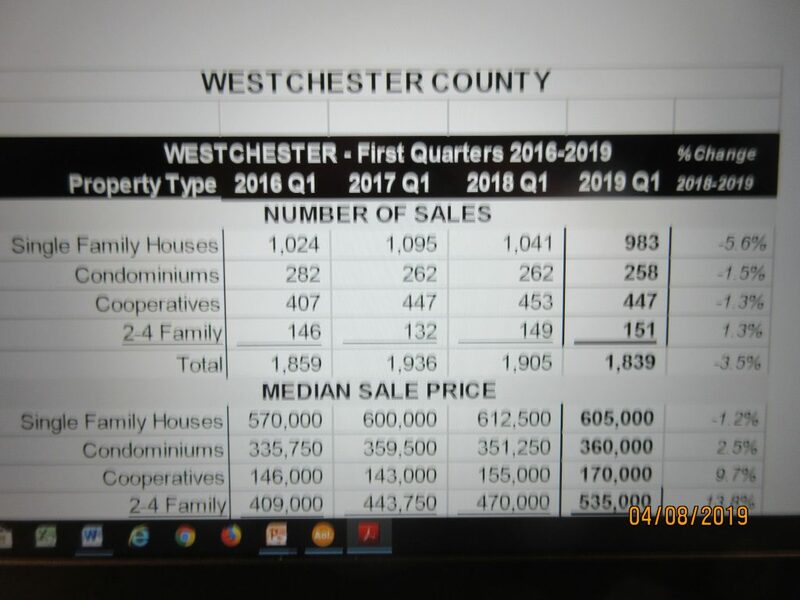 Westchester residential sales declined 3.5% in the first quarter of 2019 from the first quarter of 2018. The median price (price of a middle of the market single family home the home most in demand) declined to $605,000 from $612,500 a year ago. Sales of Single Family Homes declined 5.6% from last March. Buyers are considering co-ops and 2 to 4 family homes more than single family residences and condos.. The 2 TO 4 Family Home median price went up over $100,000 13.8% to $535 ,000, up from $419,052 a year ago. The average price of a 2-4: $551,007, an astounding advance of 16.2% (to this reporter). Aside: it remains to be determined whether these are speculative sales by real estate investors, or actual first home buyers. Condos declined 1.5% in sales but gained in price with a median sale of $360,000 up 2.5% from March 31, 2018. The average condo sale was $426,251 up 2.5% over a year ago. Co-ops hummed going up 9.7% in price (median: $170,000 up $9,000 from $155,000 from the end of last March. Average price of a coop: $193,968, about $5,000 more than last year at this time. Single Family Homes– the in-demand market —not so good. The Single Family Homes were down 5.6% at 983 sales, 41 homes less 1,024 in last year’s 1st quarter. 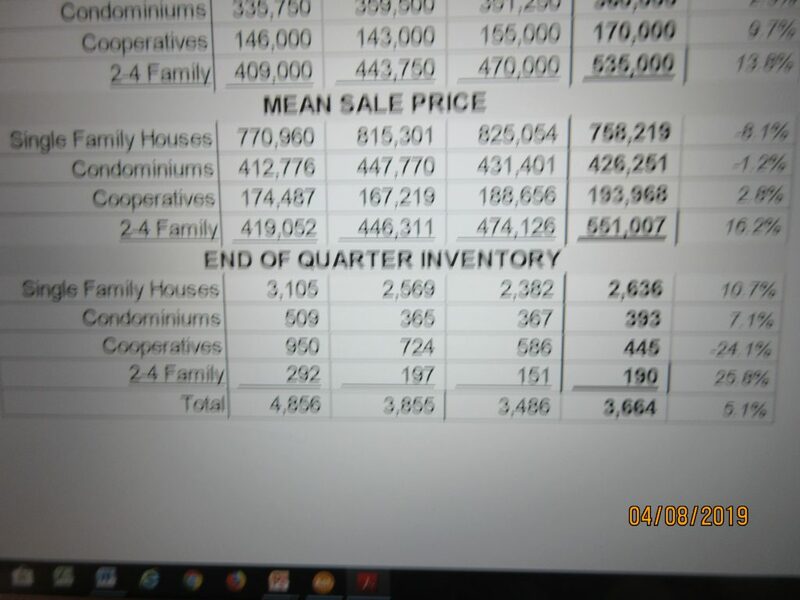 The midpoint sales figure of all sales of Single Fams, half above, half below sold above or below this price was $605,000. Down from $612,500 from a year ago, a 1.2% decline. Average price of single family home this first quarter $758,219, down 8.1% from a year go. The higher average price reflects sales of more expensive homes inflating the median figure of $605,000 to $758,219. “Westchester and Rockland Counties, the areas with the highest price points, saw an easing of critical inventory shortages which could translate to healthier spring sales a result of better product (housing) selection and an easing of upward pressure on prices.